Changeable conditions made qualifying for the sixth DTM round of the year at Nürburgring to a matter of luck. Swede Mattias Ekström coped best. The Audi driver set the fastest time and secured himself first place on the starting grid for the 17th time in his career. “I am very, very happy. At Abt, we are used to success and we were really annoyed by the results so far this season. Today, everything was spot-on, that is perfect. 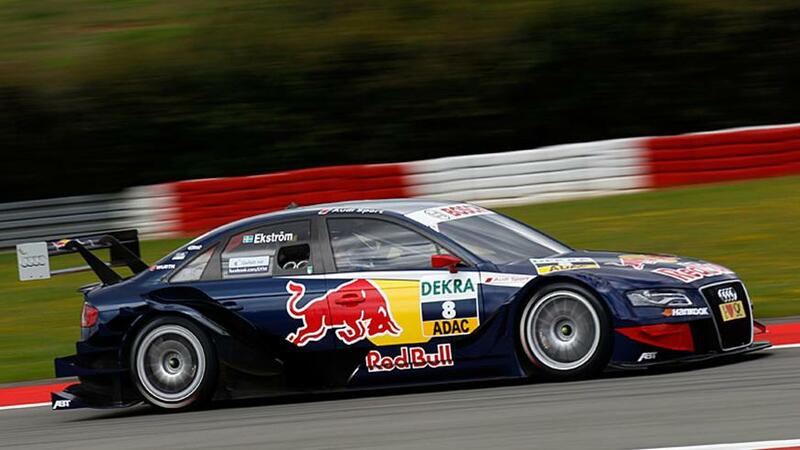 One also needs luck, because bad luck doesn’t get you any further”, the 2004 and 2007 DTM champion said. Ekström completed the 3.629 kilometres long lap of the Nürburgring in 1:32.066 minutes. With a considerably delay of 3.180 seconds, British driver Jamie Green (Mercedes-Benz) set the second fastest time in the final qualifying heat. “Conditions today were really difficult. Timing for the lap was crucial. I am very happy with second place, it gives me all the opportunities for the race”, the Mercedes-Benz driver said. Audi driver Mike Rocenfeller was also very happy after qualifying. Following his success in the second season round at Zandvoort and his serious accident in the Le Mans 24 Hours, things didn’t go well for the 27-year old. In front of his home crowd, the driver from nearby Neuwied claimed third place on the grid. Points’ leader Bruno Spengler (Mercedes-Benz) was beaten in the fourth qualifying heat for the first time this season. The Canadian, who decided four out of five qualifyings in his favour so far, will now be starting from fourth place on the second row. Once again, DTM novice Edoardo Mortara from Italy showed a very convincing performance. With his Audi A4 DTM, the 24-year old, the champion of the 2010 Formula 3 Euro Series, ended up fifth, making him the best-placed driver of a 2008-spec car. Mortara’s Spanish fellow-Audi driver Miguel Molina occupied fifth place. Martin Tomczyk (Audi) didn’t get himself the optimal position in the battle for the championship lead. In changeable conditions, the German didn’t find the right time for an optimal lap and only set the seventh fastest time. In the drivers’ standings, Tomczyk has 36 points, ranked three points behind leader Spengler. After his second starting grid position in the previous DTM round at Norisring, British Mercedes-Benz driver Gary Paffett will only start from 13th place in the Eifel. Fifth in the drivers’ standings, Ralf Schumacher (Mercedes-Benz) was disappointed. In his home event, the driver from Kerpen failed to make it into the second qualifying heat and now has to try to make up positions from 17th place on the grid.